Pack size: 1 x 100ml bottle. Review Blephasol Great for people who suffer from blepharitis. Review Blephasol This is what I always use at home and it's great at removing eye makeup as well. I wish it was a little cheaper but it is definitely the best product of it's type that I have used. Review Blephasol Blephasol does an excellent job of cleaning my eyelids and eyelashes. Blephasol I love this product! Removes make up really easily and makes my eyelids feel smooth and moisturized. Blephasol I use this as a make up remover although I love that it also helps against my blepharitis. Really good idea for a product! Love it! Wearing contact lenses can be tough, especially when it leads to dry eyes and blepharitis - an eyelid inflammation that causes soreness. So any products which combat conditions like blepharitis are extremely welcome. Blephasol is the market leader in dealing with inflammation caused by dry eyes. 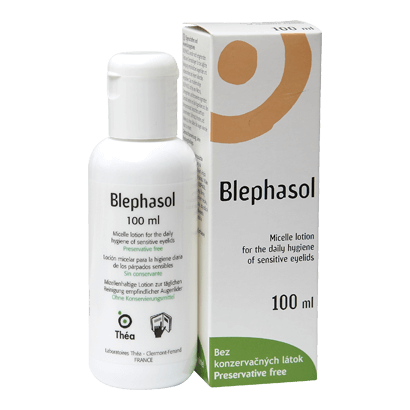 Formulated by the technicians at SpectrumThea, Blephasol is a lotion which will immediately lessen the symptoms of blepharitis. Plus, any lens wearers prone to dry eyes will benefit. The lotion is very easy to apply. Simply dab some onto a gauze pad or cotton wool bud and apply to the inner part of the lower, inner and upper eyelids, using a separate pad for each eyelid. There is no need to wash away the lotion after application, and the lotion can also be applied twice daily on the affected regions of the eye making it extremely convenient to use. Can be used in conjunction with Blephagel, which is applied overnight to affected areas, as well as Blephaclean sterile wipes, also produced by SpectrumThea.